The village is hanging its claws to the hill its built on, making for some nice down-whirling cobblestoned path to the main square. As you progress, you take notice of the highly commercialised vibe which is not one of Metsovo’s strong points. Nonetheless, there are enough attractions to make it a destination whether you’re staying in the village or even to the remote part of Anilio and the famous Grand Forest hotel nearby. 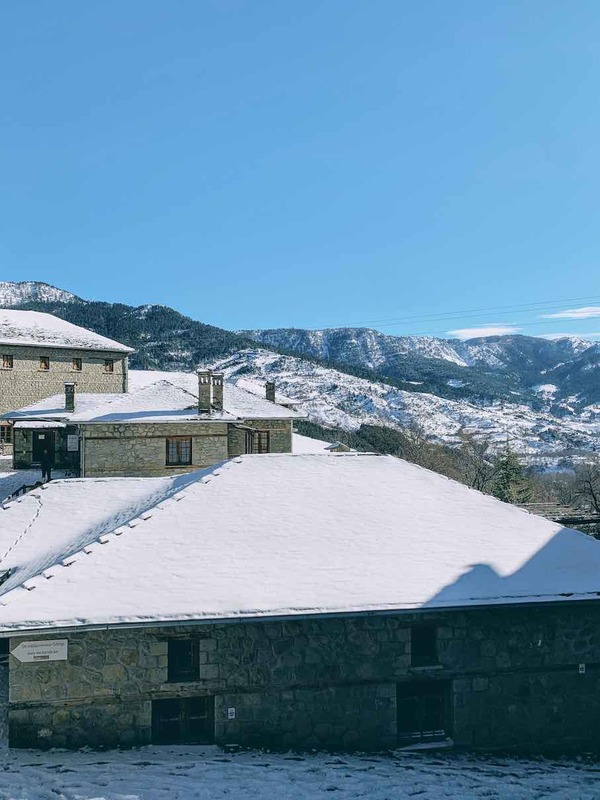 First and foremost, the Katogi Averof Winery and Art Gallery will ease you into the more folk part of Metsovo to get a better understanding of its roots. Opening times are tricky as both operate mostly during the morning hours so budget accordingly. The Folk Art Museum that is housed in the Old House of Tositsa is also spectacular with an incredible collection of old costumes, jewelry, and coins from the Greek-archaic era. Anilio is also just 5 km and 10mins away through Egnatia Odos with the famous church of St Nicholas and its 17th century art pieces, one of the most important monasteries of the area. When you’re good with your culture fix there’s nothing better than going out in the woods and exploring nature. There are vast hectares of forest in the Pindos region and enough to drive around for any least a couple of hours each way - but if you want to get a quick glance, head to the village of Miliotades for some truffle hunting. Christos Ziavras, an active member of the rescue forces of the area, and a group of more than 12 hunting dogs are highly trained to navigate you around and introduce you to this fun activity that takes place in the fall (mostly Sep to Dec). When the hunting is over, not only will you take away the valuable findings with you, but you will also enjoy a homemade meal (think mushroom and truffle soup…) with Christos and his partner Katerina next to a cosy fire in the woods! As you head further up you can drive to Vovousa. Despite its endless spiral of narrow roads and drives during the 1hr ascend, Vovousa is a small picturesque settlement up on the mountain waiting to be discovered. You can walk around the main stone bridge of the village, have a hearty meal at the taverna and enjoy some time in nature. The small taverna right in the centre of Vovousa is a beaut! They produce their own feta cheese, only made from cow’s milk with a perfect tangy and peppered taste to it. Their signature dish is indeed the fried eggs over fried potatoes and country sausage so make sure you get there prepared. When the weather is good they also have tables outside, right by the river, which can also be beautiful. Budgeting for a good accommodation is key when you’re in Metsovo so that you can comfortably unwind and enjoy some quality time with your loved ones by the fire. Grand Forest is indeed a perfect choice, despite its high rates during the more seasonal dates. There is ample space in the two separate lounges to hang out and relax, a wide range fo treatments at the small spa for those wanting to indulge and the view to Anilio and Metsovo is astounding! For a perfect day trip from Metsovo you have to visit the 6 Meteora monasteries. A series of peaceful monasteries built upon the rock formations of the area on top of Kalabaka town. The road to get there is only about 1h 30mins and the view from up there Is amazing! St Stephanos monastery is the one most travelers visit as everybody can get there by car. For the other ones you’ll have to be a bit more daring as there a few hundred steps before you finally get there and the opening times can vary! The descend from Meteora to the town of Kalabaka is magical! Ta pente Phi - the most famous taverna of them all, known for its wide variety of meat and the way they serve this on wrap paper and no dishes. Try everything! Pepe - casual setting for some drinks and nibbles; try their fried metsovela cheese! La Pounti - family-run taverna by the river in Vovousa. Must not miss their homemade feta cheese!